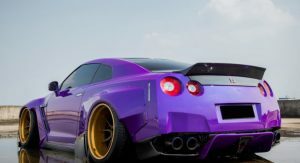 The Nissan GT-R may no longer be the king of the road like it was a decade ago, but it is still an absolute animal when unleashed. 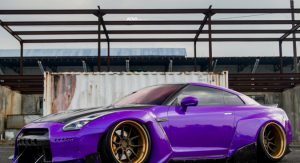 Unfortunately, the decisions of this GT-R’s owner means it is no longer the performance beast it used to be. 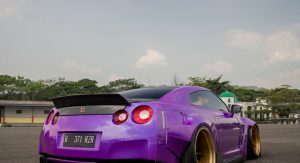 This particular GT-R resides in Indonesia and looks so wild that it’s almost hard to comprehend what would motivate an owner to overhaul the sports car in such a way. 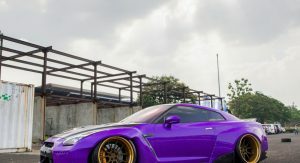 The most obvious point of difference between this GT-R and any other is the bright purple paint scheme (it almost looks like FCA’s plum crazy color) could that’s offset with a selection of carbon fiber parts, including the hood, and ducktail rear spoiler. 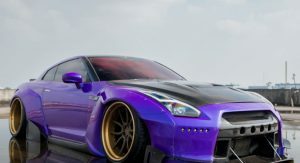 A purple GT-R that retained all its standard body panels would be eye-catching as is, but this car has then been fitted with a widebody kit from Rocket Bunny. 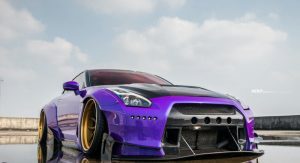 It adds a prominent front splitter and new bumper, bespoke LED daytime running lights, and large carbon fiber aerodynamic curtains on either side of the front bumper. 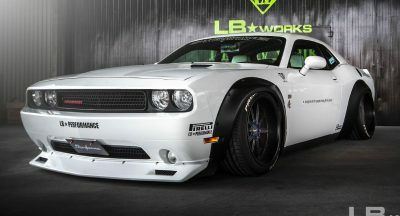 Additionally, the bodykit includes flared wheel arches, a distinctive rear diffuser, and a custom decklid. 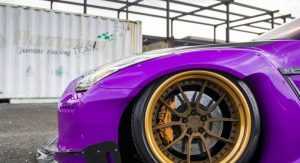 To complete the over-the-top look, the Nissan has been outfitted with a set of 21-inch ADV.1 Wheels with a gold outer lip and bronze spokes and ‘benefits’ from an air suspension system that drastically reduces the vehicle’s ride height. 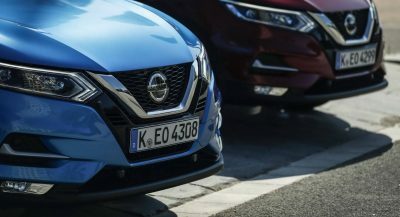 Even though in these images the car appears to have less than an inch of ground clearance, which would make it virtually useless anywhere other than a smooth parking lot or perfectly-manicured lawns, it should have a height adjustable suspension. 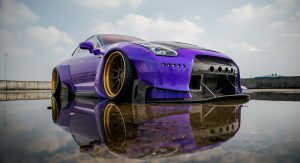 Another opinion post on cars. C’mon. You know that this is a show car, and again, it’s on AIR suspension that adjusts at a press of a button. Any car this low is on air because if it’s static or coilovers, you won’t be going anywhere. Don’t care what you say here, it looks phenomenal in terms of quality of work despite if you don’t agree with some of the design choices. Well that’s how media supposed to work, they just cater the demography of it’s readers. 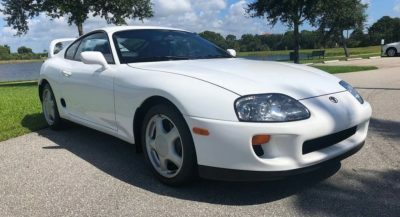 Most people here don’t like this kind of HIN style modifications and understand the irony of sports car being turn into nothing but a sculpture. Yeah never really fancy this type of modification, clearly just to impress certain category of age, beside in Indonesia? The road is bumpy, uneven and full of potholes.